Join us for a can't miss event! Makeup artists from bareMinerals will be joining us at Solutions to spend time with you! We are so excited to host this event. Guests will get to spend 20 minutes in a 1-on-1 session with one of the bareMinerals makeup artists. ﻿Want to master a smoky eye? Dying to get the hang of contouring? Need help making your lips pop? Your targeted session will teach you the tricks of the trade in a way that you can take home and feel confident about. You will be a Master! This event is also a great opportunity to learn more about the new & improved products from bareMinerals. *Deposit will be returned towards your bareMinerals purchase during the event. Let's celebrate the amazing women in our life! Whether she is a biological mom or someone who showed you how to live, love and give, we invite you to celebrate her with us this Mother's Day. When we started thinking about Mother's Day, one of the biggest sentiments that came up was the selfless love and devotion we see lived out by our moms. The women we admire the most put it all on the line. They are bold. They are fearless and they are relentless in the pursuit of growing the ones they love. Our mom's are family by both biology and by choice. So often we see her putting her own needs and wants to the side to give more to her children and loved ones. This is our opportunity to give back. Celebrate her selfless love and her sacrifices. Give her a little respite. Some time to relax and enjoy the fruits of her labor. Choose one of our spa package gift certificates and watch her face light up with joy. Feeling beautiful doesn't always come with the mom territory. A quick and easy way to get a little pick-me-up is with a pop of color on her hands and feet. 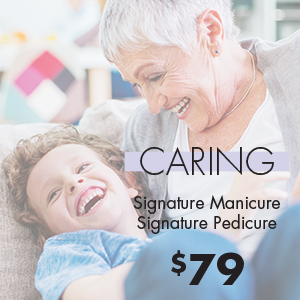 Our Signature Manicure adds rich moisture to her busy hands through a paraffin dip and the extra massage she gets in the Signature Pedicure will have her relaxed and ready to take on the world. This is a perfect way to show her how much you love and appreciate her and everything she does for you. Mom spends a lot of time on her feet taking care of this and that and everyone around her. 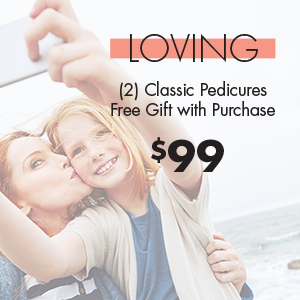 Treat her tired feet with 2 visits to the spa for a Classic Pedicure. She will get to soak her feet in a warm foot spa, and enjoy a light exfoliation, foot massage and moisturizing masque. Our state of the art pedicure chairs feature a warm massaging option to further enhance the experience. Plus, she'll be able to maintain her results at home with the free gift with purchase. In our busy lives, it seems there is never enough time to relax and treat ourselves. This can be especially true for moms. Mother's Day is the perfect opportunity to give mom an excuse to carve a little time out for herself. This package will have her refreshed and back to a beautiful glow in no time. She will enjoy a 60 minute Swedish massage and a relaxing facial in the warm comfort of our beautiful spa. Her skin will look amazing after being treated with our all-organic skin care line from Eminence Organic Skin Care. She will be sure to thank you for this gift! Can we meet your friends? So things have gotten pretty serious between us and we think it's time we meet your friends. We love how amazing you are and we know your friends are too. 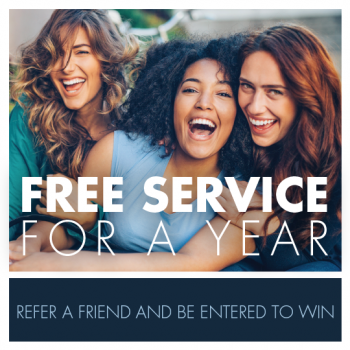 Invite a friend who has never experienced Solutions to try us out during March and when they return the certificate you give them (get it from your fave Solutions employee) that gives them $15 off their visit, you will get entered to win one FREE SERVICE FOR A YEAR!!! Ask your fave Solutions employee how you can be a part of this! This referral promotion is for all salon and spa departments. Referral must be a NEW guest to the salon employee you are referring them to. New guest must present the referral certificate at the time of their service to receive $15 off and to enter you into the drawing. Winner may choose one service from the following: Hair Color, Therapeutic Massage, Eminence Organic Facial or Classic Pedicure. Winner will receive one visit of the service of their choice each month for a period of 12 months. Winner may not share their free service and there is no cash value to be redeemed. You may refer as many guests as you would like and each guest that redeems their certificate by the end of March will earn you 1 entry in the drawing.